It is great to be back at the Paul M. Hebert Law Center. Susan and I have been here now for a little over three weeks. On June 30, we loaded the three cats in the car and began the drive south and west from New Hampshire, arriving in time to celebrate the 4th of July in Baton Rouge, the city where three of our four children were born and where all four of them spent a significant, and fun, part of their childhood. As many of you know, in 1998, the Galligans left Baton Rouge and LSU; over the intervening 18 years whenever I have been lucky enough to address Louisiana judges and lawyers, some of you were nice enough to suggest that someday perhaps I would consider coming back. Well, being here now feels like coming home. It is an honor and a privilege to be the Dean of the Paul M. Hebert Law Center, and it feels fantastic to be a Professor of Law once more. As I reflect upon my good fortune, I realize that I have been preparing for this wonderful job for my whole career, and now the dream of leading the LSU Law Center is reality. 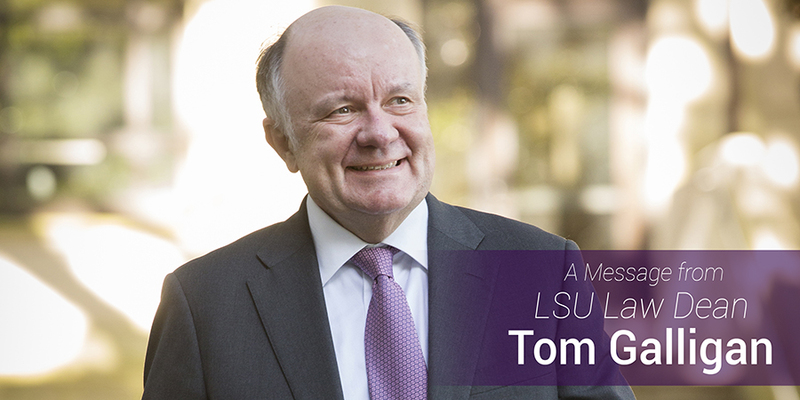 LSU is a great law school, and we shall work together to make it even better tomorrow than it is today. There are challenges, but the opportunities are fantastic. So, what have I been doing in my first month here? I’ve been trying to learn as much as I can about the law school today. I keep reminding myself that while I love LSU and I have fond memories of my time here, I am now the new kid on the block and I must put aside my memories and prior perspectives. In doing so, I can unequivocally say I am excited about what I see. I have been meeting with faculty; I have met with our administrative staff, both individually and in groups. Significantly, some of what I have learned is that we expect a larger incoming class of students than last year. When we have final numbers we will let you know! Admissions Director Jake Henry and his staff have done a fantastic job as did Interim Dean Bill Corbett, who devoted substantial time to recruitment efforts. But the work is not done. We want to make sure that we do not lose students who have deposited with us to other law schools before school starts. To that end, last week we have hosted evening events for our deposited students in New Orleans and Baton Rouge to welcome them in advance to LSU Law. I have also learned that in the class of 2015, 91 % were employed within 10 months of graduation, with 95% of the class reporting: 83% were in bar required positions while another 12% gained employment in J.D. advantage jobs. These are outstanding numbers. Finally, last July, 82.7% of our graduates who took the Louisiana State Bar Examination for the first time passed– the highest percentage of any of the state’s four law schools. Of course, that was no surprise to me because LSU has consistently led the state in bar passage. I have also learned about the exciting progress we are making with the John P. Laborde Energy Law Center at LSU, which includes the development of our Energy Law and Policy Certificate, the LSU Journal of Energy Law and Resources, field placements in energy law and policy, and more. I have reconnected with many alumni who have stopped by the Law Center to say hello and I saw lots of old and new friends at the Baton Rouge Bench Bar Conference in Point Clear, Alabama, where I made two presentations: one with Chancellor John Pierre of the Southern University Law Center on Law School Today and one with Bill Corbett on Recent Developments in Torts. On July 25, we welcomed 46 students to our Legal Methods, which is designed to further hone the participating students’ skills to facilitate their success in law school and beyond. This Thursday, August 4th, we will host an open house reception with our Baton Rouge area alumni at the Law Center. If you are not from Baton Rouge, we will be coming to you because this fall we will meet with alumni across Louisiana and in Houston, Dallas and Washington, D.C.
On August 8, 3L students will begin our one-week trial practice program. The program is an intensive experiential learning opportunity in which the faculty oversee our students as they learn, practice and apply trial practice skills. Based on the National Institute for Trial Advocacy model, it is totally learning by doing. This year a dedicated group of alumni have revamped the program to make it even more practice heavy and relevant to what lawyers need to know how to do today to serve as competent advocates for their clients in litigation. We thank them for all their work and look forward to hearing the positive results. Sadly, the last few weeks have also been tragic. In Baton Rouge, we have seen the killing of Alton Sterling and three law enforcement officers. In between those tragic events was the Nice truck rampage and the shootings in Dallas. LSU Law actually had five students in Nice on the night of the killings; thankfully none of them were injured, but we are all too close to these events. We know we all have work to do to find solutions to the violence that plagues our world. At LSU, we think a law school has a role to play in facilitating the dialogues we all need to have on issues of violence, equality, race and justice. We hope those deep, hard conversations will lead to solutions. I believe that participating in law reform efforts is an important thing for a law school to do, so after the conversations we will work with our community to implement solutions. In this regard our Diversity and Professionalism Committee will host a number of conversations this year; the kick-off program will be about civility and having hard conversations. The Pugh Institute is beginning to plan several symposia on the issues that confront us, and the Black Law Students Association will host a program on knowing your rights. Finally, we know that our ability to do great things depends upon you. You support us with your philanthropy; you support us by hiring our graduates; you support us as adjunct faculty, guest lecturers, field placement site supervisors; and more. I am excited about seeing you to thank you and to talk to you about what you can do to help our law school stay great and be even better tomorrow. It is good to be home at LSU.